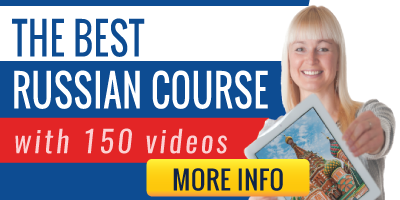 Learn and improve your Russian: Here you will find grammar and vocabulary videos, grammar tables and exercises to practice your Russian. Vocabulary exercises: Can you get 10 questions right? Each of these tests deals with a particular topic (numbers, colours, animals, days of the week...). If you need help, you can watch a video with the vocabulary used. Russian grammar: We have created these useful grammar tables to help you with pronouns, nouns and adjectives. Grammar is an important item that you have to take into account when learning a foreign language. Grammar activities: Short exercises to help you practice your grammar knowledge. They are arranged in 3 levels, from beginner to advanced. If you want to keep your language skills in good shape, don't forget to train them here for free.